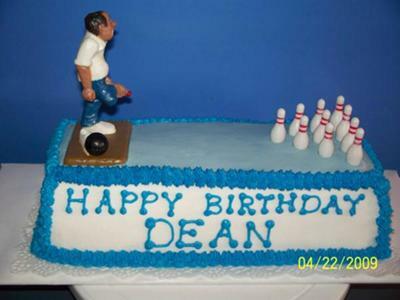 This bowling cake was also for my brother-in-law, so he could take it to the bowling alley! I used a long loaf pan, it held an entire cake mix. I baked according to directions and let cool completely. I used buttercream icing in white and blue. I found the little bowling man at a bakery and the bowling pins at a dollar store.